You can create this game with MicroWorlds EX free trial software in about an hour. Mini golf is a fun game in the real world and in the video game world, too! Creating a mini golf game like the one shown in the figure requires painting a green, hole, and water trap; coding controls for aiming and hitting the ball; and coding reactions to the hit (falling in the water, bumping off an obstacle, and sinking the ball). Download the PDF for a step-by-step guide to creating your own Mini Golf game. Quickly create a golf ball in MicroWorlds EX by modifying an existing shape rather than creating one from scratch. This video shows you how to create an object (or “hatch a turtle), transform a soccer ball into a golf ball, and then turn your turtle into a golf ball. 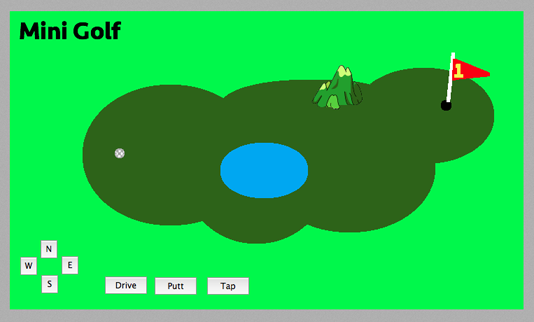 Learn how to create buttons to direct and hit your golf ball in MicroWorlds EX. This video shows you how to create commands to drive, putt, or tap your golf ball north, east, south, or west. It also shows you how to maneuver your golf ball around the obstacle on your course. If the turtle (your golf ball) falls into the water trap or the hole, make your game respond appropriately by creating on-color instructions, which you accomplish in MicroWorlds EX by creating Procedures. You put together Primitives to make Procedures, and you put together Procedures to make other Procedures. You can create a flag for your hole to make your game look more fun and realistic, and think about freezing the golf ball so that no player can cheat by just grabbing it and putting it in the hole.